Since the tender age of nine, Hayate Ayasaki has been working to pay off his degenerate parents' gambling debts. Before they disappear, the parents sell their son’s organs to the yakuza to cover their debts. Hayate is working various part-time jobs to pay off the debts when fate brings Hayate to teenage heiress, Nagi Sanzenin a/k/a “Ojô-sama.” She is the frequent target of kidnapping plots and of various schemes by people trying to get her money. Hayate becomes Ojô-sama’s butler, zealously protecting her, while she falls in love with him. 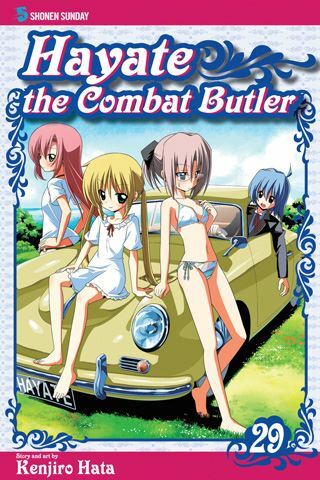 Hayate the Combat Butler, Vol. 29 opens with Hayate, a sleepy Ojo-sama, and a dog named Armageddon. Then, Saki the Maid has to find a new job when her boss Wataru Tachibana explains that his video store (where Saki is the maid) is slowly going broke. All he needs is a cash infusion... Also, pop idol, Ruka Suirenji, returns just in time to find Hayate dressed as a girl... but she thinks that Hayate really is a girl named Hanako Tanaka. THE LOWDOWN: The Hayate the Combat Butler manga continues to be as charming and as entertaining as ever. That's what I usually say. My VIZ Media rep has been sending me copies of the Case Closed and Hayate the Combat Butler manga for years, and I have found them to be reliably entertaining reads, although I was initially cool to Hayate. Hayate the Combat Butler Volume 29, like previous volumes, is a parody and send-up of manga and anime and the surrounding culture and pop culture. Creator Kenjiro Hata is having too much fun putting Hayate in drag, and you, dear reader, can have fun with this manga. I READS YOU RECOMMENDS: Readers looking for comedy about manga and anime can find laughs in the Shonen Sunday manga, Hayate the Combat Butler.